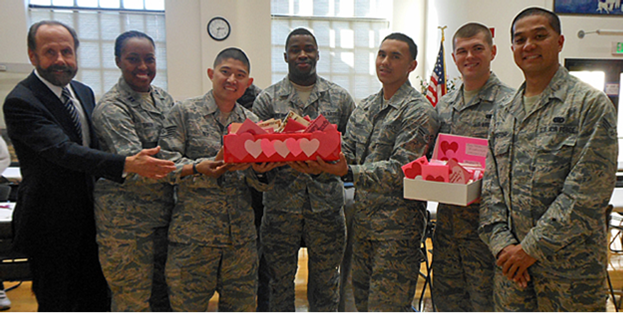 Members of the Mountain View-based California Air National Guard 129th Rescue Wing with Senator Jerry Hill receive 400 valentines made by South San Francisco seniors for Wing members who were recently deployed to Afghanistan and the Horn of Africa. From left, Hill, Captain Jennifer-Ruth Green, Staff Sergeant Jerald See, Airman First Class Tajudeen Mackey-Shittu, Airman First Class Joseph Harris, Airman First Class Raymond Perdue and Senior Airman Jet Crisostomo. Four hundred handmade valentines created by South San Francisco seniors are on their way to members of the California Air National Guard 129th Rescue Wing who were recently deployed to Afghanistan and the Horn of Africa. 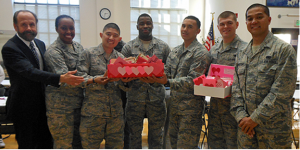 State Senator Jerry Hill joined seniors at South San Francisco’s Magnolia Center to complete their annual valentine crafts project and present their handiwork to members of the California Air National Guard 129th Rescue Wing, based at Moffett Federal Airfield in Mountain View. The seniors, staff members of South San Francisco Senior Services and volunteers made the valentines over several days. They put the finishing touches on their greeting cards on February 1 with Hill, other friends of the senior center and six members of the 129th Rescue Wing, who came to the senior center that day to receive the valentines and ensure their delivery to the deployed airmen. About 165 members of 129th Rescue Wing were deployed in support of missions in Afghanistan and the Horn of Africa on January 25. “This is an incredible opportunity for us to be a part of this [event] and to see the people who really support us, to see the people we’re fighting for,” said Captain Jennifer-Ruth Green of Rio Linda, Calif.
Staff Sergeant Jerald See of San Mateo, Senior Airman Jet Crisostomo of Fairfield, Airman First Class Tajudeen Mackey-Shittu of Anchorage, Ala., Airman First Class Joseph Harris of Oakland and Airman First Class Raymond Perdue of San Francisco joined Green to lend a hand to the seniors and admire the many greeting cards. South San Francisco School Board Trustee Judith Bush and Parks and Recreation Commissioner Richard Holt and his wife, Jeannette, also rolled up their sleeves to help with the crafts project. The senior center’s valentines go to deployed members of locally based military units or veterans of locally based units each year. With the valentines going to National Guard airmen this year, the activity held extra special meaning for Hill. He served as a staff sergeant in the California Army National Guard from 1966 to 1972. Hill began the valentine crafts project with the South City seniors as a state assemblyman in 2009. The activity continued for each of his four years in the Assembly. This is his fifth year of participating in the seniors’ project; his first as a state senator.